For me, few things give me more pleasure than donuts. I love absolutely everything about donuts- how they look, taste, smell and even how they complement a warm cup of coffee. What is there not to like about them? And I definitely know I’m not the only one in the world who thinks as highly as I do about donuts. Let’s soon right straight into why I believe donuts are Heaven’s gift to all of mankind. Whilst donuts may not exactly be superfoods, it turns out they possess the ability to provide your brain with what it needs to kick-start your day in an effective manner. This is especially if you are experiencing trouble concentrating in the mornings. This may be because the needed amount of sugar in the form of glucose for the brain to function normally may be lacking. Now, it may be important to know that your brain produces an important neurotransmitter chemical by name, acetylcholine which is necessary for having a good memory, increased concentration ability and also a positive mood in general. Sugar here, acts as a source of energy to particularly produce this chemical and what better way to get your source of daily glucose than to get it from donuts? Did you know that only three donuts consumed for breakfast could help you attain your calorie intake for the entire day? Donuts are packed full of gluten so you are certain to end up with a full stomach after the consumption of only three donuts. 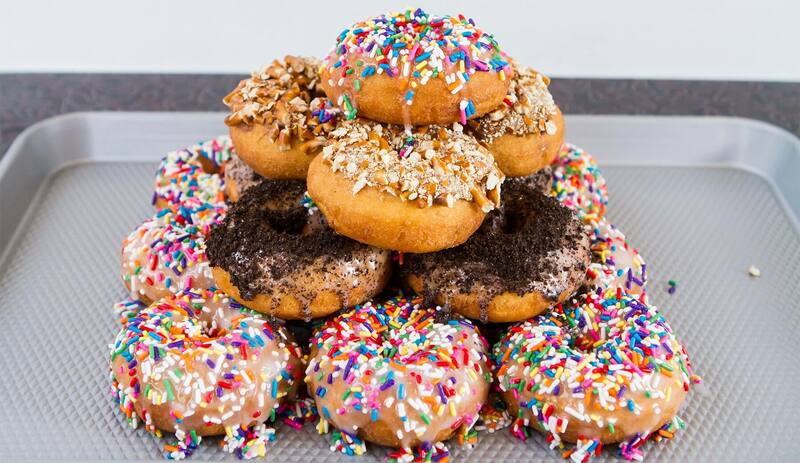 Donuts are perfection and culinary master arts whichever way you look at them. Coming in so many shapes and sizes, we’ve got twisted donuts, jelly donuts and even squared ones so what is there not to appreciate about these little wonders? Donuts always make your inner-child bloom with happiness. Ever wondered why you have never witnessed anyone eat a donut and not smile? Well, it is because it is almost impossible to behold such a sight as you could never go wrong with a fresh, hot and mouth-watering donut. No matter how old you are, you are likely to squeal delightfully with every bite you take. Don’t you think the best life is one where you practice a little self-love each day? Experts say the happiest folk are those that set aside time each day for themselves. Setting aside time rewarding yourself with hot, mouth-watering and tasty donuts is a sure way of showing yourself that love that you always need in order to keep staying happy. Donuts are basically cheap. In fact, 2340 calories of one box of donut can be gotten for as cheap as $8 which is an absolute steal. This presents an affordable opportunity to provide that loves one a great he or she would never forget in a long time. At The Glass Knife, we offer some of tastiest and high quality donuts in Orlando. Pass by sometime and experience Heaven on earth with your donuts.